Way back in the age of dinosaurs, Mike is busy chiseling away at a rock while his brothers and Renet get ready to play some baseball. Renet is concerned that she won’t be very good, but the Turtles assure her that she’ll be the best baseball player on Earth… at least for the next million years or so. 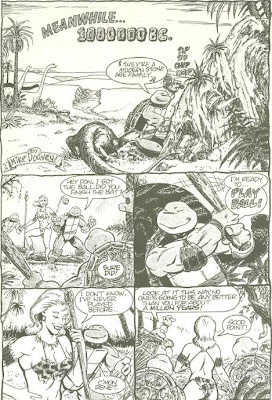 The Turtles hunt down Mikey and ask what he’s doing to that rock. Mikey responds, “Giving some archeologist a heart attack!” and leaves his work to play ball. 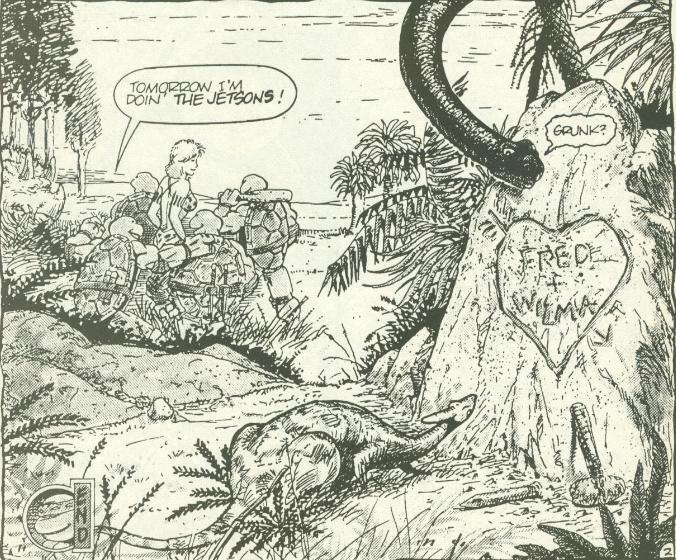 On the rock, he’s chiseled a heart with the names “Fred” and “Wilma” inside it. *This story takes place during the three month period the Turtles and Renet were trapped in the prehistoric era in Tales of the TMNT (Vol. 1) #7. More specifically, it takes place between panels 4 and 5 of Page 35 of that issue. *The stories “Spinal Tapped” and “Sweat, Sweat, Sweet Renet” also take place during that three month span of time. Well, this was a cute little two-page story, though that’s all it really amounts to. I never felt that the stories written into the three month gap from Tales of the TMNT (Vol. 1) #7 really did much with the predicament and potential stories that could be told with the Turtles stuck in dinosaur times. Even the meatier “Spinal Tapped” was just another Savanti Romero battle (and a continuity headache, though that’s a review for another day). You could tell that the Mirage guys left that gap in there so they could go back and fill it in with anything they wanted, but all we ever got before “Spinal Tapped” came along were a pair of comic relief shorts. And only one of them (this one) was any good. It’s something you’ll notice if you sit down and do a thorough reading of the Mirage volumes; that the writers often set up a lot of potential story threads but would become too sidetracked with other ideas to ever revisit them. Though the three-month gap in Tales #7 was indeed revisited, it was only for some humor strips and a rather pointless back-up tale. Anyhow, I find myself not really talking about this story much, hm? I guess that’s because it’s the first of the three Tales #7 “insert stories” that I’ve reviewed so I’m sort of just getting my feelings in general about that out of the way, now. Dooney’s art is certainly nice. He draws Renet looking not much like a teenager, though at least he draws her rather attractively. Lawson’s Renet has always been and will always be positively hideous, and as he’s the artist who draws her most commonly, it’s a rare sight to glimpse Renet without a stick figure body with two huge beachballs pasted on her chest, tiny black dots for eyes, a head shaped like a flower vase and jagged, angular lips. A Renet that’s actually cute-looking is something to be savored, even if she looks like she’s 16-going-on-29. I love this short, if only because if I had a time machine, stuff like this is all I'd ever do with it. 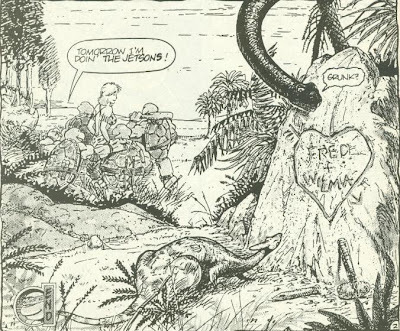 Did this story appear anywhere else besides the "Shell Shock" TPB? Not to my knowledge. Forgot to add the publication info to the review. Fixed! 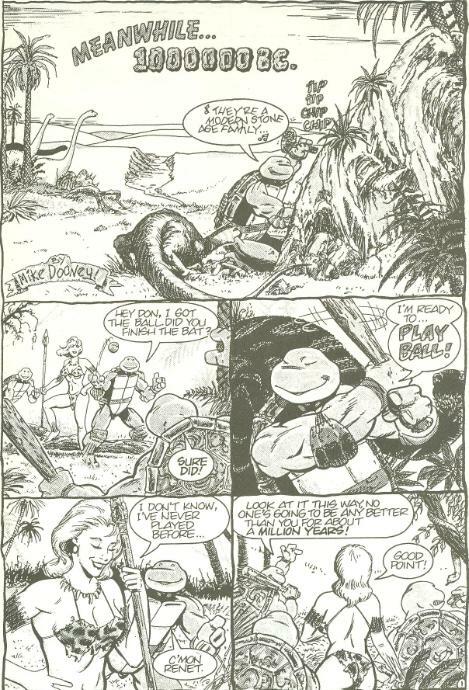 Actually this story has been reprinted in "Teenage Mutant Ninja Turtles Classics Volume 1". Oh yeah, I forget to account for those. Thanks for the heads up.